(Photo: LWF / Felix Kalbe)Lutheran World Federation President Bishop Dr Munib Younan (L) LWF General Secretary, Rev. Martin Junge, German President, Joachim Gauck, and Reiner Haseloff, Minister-President of Saxony-Anhalt on June 15, 2016. Germany's President Joachim Gauck has noted the enduring impact that Martin Luther's ideas had on shaping his country's language and sense of identity. Gauck, a former opponent of the communist East German regime expressed gratitude to Lutheran World Federation delegates he addressed in Wittenberg who had gathered "in a free country and in ecumenical solidarity." A former Lutheran pastor, Gauck, became German president in 2012 and was speaking in the eastern German town where nearly 500 year ago Martin Luther nailed his history changing 95 theses to a door in one key events that triggered the Protestant Reformation. 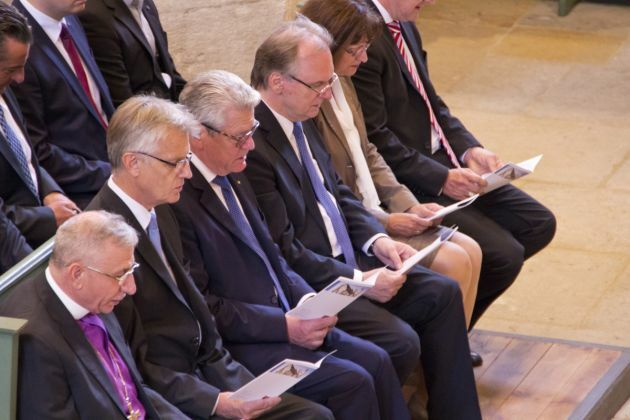 "Without the Reformation Germany would be a different country altogether," Gauck noted, referring to the "enduring and deep impact" of Luther's ideas when he addressed members of the LWF's key governing body, its council during its June 15-21 meeting. . While Luther had not been the first to translate the Bible into German his powerful and poetic use of language quickly helped to give Germans "a sense of identity." Furthermore, Gauck observed that the Mass was first celebrated in German in that very same church, the City Church, which was "an important step towards the priesthood of all believers." The German president thanked the LWF for its "practical and spiritual assistance" in its work for refugees who now account for some 60 million people worldwide. In the many activities for refugees the LWF is engaged in Gauck said the Lutheran world body, with more than 70 million members has remained committed to church unity. "It engages in dialogue with the Catholic and the Orthodox Church as well as with Anglicans, Reformed Churches and other Christians. And it regards both the ecumenical movement and interfaith dialogue as key responsibilities." The Lutheran World Federation held its annual governance meeting in historic Wittenberg and there it reelected its general secretary Chilean pastor, Rev. Martin Junge to a second seven-year term effective from Nov. 1, 2017.